Phew close one here for the GOAT but he used his experience to see off an inspired Ivo Karlovic 7-6(8) 3-6 6-3 to make his 11th Basel final and setup a tie against red hot David Goffin who is 43-2 since Wimbledon. Like I said in my prediction I fancied Karlovic to get a set but what I didn't expect was him to serve as well as he did. I knew going in Ivo was going to serve a lot of aces but in this one he managed 33. That's more than a sets worth of free points. Insane. As usual though Fed stayed calm under pressure and used the Basel crowd to his advantage to get the all important break in the decider and then never looked back. Just another clutch display from the GOAT with some solid serving of his own in the first set breaker and a refusal to get frustrated when he dropped the second set. A very pleasing match and his fantastic record against huge servers continues! Federer won the toss and elected to serve holding to love to kick things off. Karlovic held comfortably too before Fed reeled off another love hold to lead 2-1. In the next game the Swiss got his first sniff of a break as Karlovic slipped to 0-40 but some huge serving got him out of trouble. Not much Fed could do really as it was imperious stuff from the 6ft 11″ 35 year old. The pattern of both players holding serve comfortably resumed until 4-4. Here Fed hit a first serve at 40-15 that was deemed an ace but Karlovic challenged correctly as the ball was out. 2 double faults followed as Karlovic made deuce. A couple of advantage Federer / deuce points later and the Croat had a break point of his own. Only a brave second serve that landed deep in the service box from Fed stopped him taking advantage. Roger then held for 5-4 and in no time at all it was 6 games all. Tie breaks are a lottery especially with Karlovic but Roger had won 12 of 15 in their previous encounters making him the favourite. He started in sublime style too with an unreal pickup on the volley to lead 1-0. It was Karlovic however who got the first mini break but he couldn't hang onto it as Fed broke back. The scoreboard moved along quickly and Roger was he first player to have set point at 7-6 but he missed a makeable passing shot. The Swiss then had to save his own set point en route to moving 9-8 in front and he took the set by getting the ball in play off the return then firing a backhand cross court pass for a clean winner. Great start. The second set was almost an action replay of the first with both players holding serve easily. Karlovic was especially impressive firing down 13 aces in total. The key moment in this one came with Federer serving at 3-4. The Swiss missed a routine overhead, got blitzed by a stunning Karlovic return, shanked a forehand and then another huge return flew past him as he was broken to 15. 2 costly errors and 2 brilliant shots by Karlovic cost him his serve and the set as Dr. Ivo closed it out comfortably 6-3. The decider was always going to be close and it was all about Roger ensuring he took care of his own service games. It was tough as Karlovic was holding serve so quickly that Roger was always under pressure but as long as he kept his side of the scoreboard moving in the right direction you fancied his chances. I was expecting a very late break of serve at the business end of the set but it came in only the fourth game. Suddenly after looking like he couldn't miss, the Karlovic 1st serve disappeared, Roger made 3 great returns to give himself 0-40 and with the crowd cheering every first serve miss from the Croat he fired down a costly double fault to drop serve for the first time in the match. I have to say it was a big choke really as he let the crowd disrupt him. Gotta give an A+ to the Basel crowd there as they gave Roger a huge boost and made the pressure on Karlovic tell. Roger then consolidated the break to love meaning he'd won 12 points in a row and and had a 4-1 lead. Karlovic looked forlorn on the court and although he got back into the groove in his next 2 service games he didn't get a chance to get back on level terms as Fed served it out to love 6-3 in the third. Chumm Jetzt! Another enjoyable match and something different to the usual baseline tennis we get which is always good to see. Yesterday we got lots of nice shot making and rallies vs Dimitrov and today we got the battle of the serves and mental strength vs Karlovic. A nice mix up of styles and more proof of Fed's versatility and ability to beat all comers. 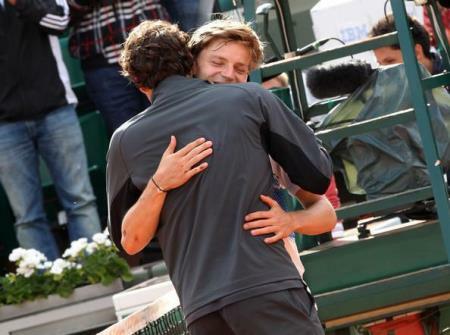 Roger's opponent in the final is the bang in form David Goffin who saw off Nadal's conqueror Borna Coric in 3 sets. I watched some of it and it was a low quality match but Goffin came away the worthy winner as his experience told in the end. Roger leads the H2H vs. the Belgian 1-0 but he surprised a few people in 2012 when he took a set off Fed at the French Open before losing in 4 close sets. He's only 5ft 11″ but he's a very good ball striker who takes the ball early. He sort of reminds me of Agassi in that sense as he's not a big guy but he can inject pace and rush players with his style. His serve is also effective too for someone of that height, I thought it was a weakness but he's served very well this week and I had him down to beat Nadal had they met in the semi finals. I'm expecting Fed's experience to get him the title here though and as long as he puts Goffin under enough pressure I think he will crack. His serve has been good this week but if he misses his first delivery he will need to red line his second serve to protect it. I see that creating plenty of double faults for Fed to feast on and get himself in front when it counts. Goffin will probably cause Fed some problems just because of his style of play so he might push him for a set but if Fed stays sharp then he has too much game for the young Belgian. I'm predicting a similar final to the one here vs Nishikori 3 years ago. Fed in 2: 6-4 6-2 althogh I think Goffin will break his serve at least once. Allez! Another solid mental display from the GOAT against a guy who was playing lights out tennis on Serve. Fended off 33 aces and used the crowd to his advantage to press home in the third. Allez! WHEW :)) close one! just like Roger’s match tonight! another Final for our guy! hope he gets his 6th basel title tom!!! CHUM JETZE!! Katyani, you have to take heart from Susie’s maiden title win today. It is possible! Stan showed that guys outside the big 4 can win Slams, Susie showed those without a first comment title can win too! Yey boss!! And like Cilic, I will be happy to be a one slam wonder!! Sorry Katyani… I know how it feels. Always a bridesmaid never a bride 🙂 Anyway, I am not a sour loser. Congrats Eldrin. Hey guys, I have been reading so much negative about the Basel crowd. But… what do people expect? Roger gets crowd support everywhere. And to be honest….. the crowd was right to do so today. When I watch Roger’s matches I almost always watch Youtube too because I am too NERVOUS. But TODAY I watched YT during the 2nd set because I was BORED !!! Oh my God, all those aces…. Karlovic is a nice guy who tries to win by doing what he knows best, but come on…. aces only?? Nothing more?? I was really bored with him. Can you imagine the crowd?? When Karlovic made that game with 3 aces and his next was a missed serve, the crowd applauded. The commies called it rude. But again…. can you blame the crowd?? He might not have deserved it, but….. Kudos to Roger, for staying calm and getting the win. Go Roger. One more match to go. Win it, stick it to Brennwald and leave Basel until he is gone…. Ofcourse knowing Roger, he will be there next year, just for the fans…. The only people who have “negative” comments about the Basel crowd are people that wanted Federer to lose. Sour grapes. Who doesn’t cheer on the hometown favorite. Roger deserves to be cheered on in Switzerland. 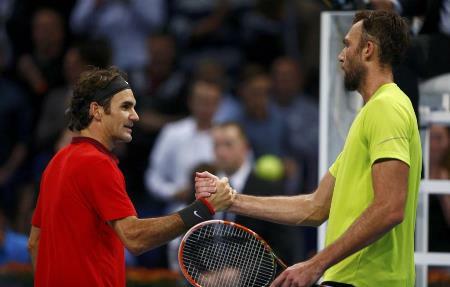 Congrats to Roger for making his 11th final in Basel. I hope he is able to win the final because I want Djokovic to continue to hear footsteps. Another joke is Nadal being ranked #3 despite doing nothing after the French Open. Go Fed! I too was a little non-plussed at the comments about the Basel crowd – problem is they expected the Swiss to be neutral – but as I said to my other half you can never be a neutral Swiss when Fed is on court, or in my case whenever a swiss team/person are playing I always cheer them on – its fun in my house when Murray and Fed play!! The Basel crowd were awesome. They got Fed the break in the decider. Hometown support for sure. Remember Fed vs. Murray at the O2 from 2012? Crazy crowd support for Fed that day, was electric. Three posts in a day? Anyway, good job on all posts today. Hope our Roger will perform a good one at the final too..
Hopefully Roger can edge it out tomorrow. I saw a recap saying he looked tired, but come on one more match Fed! Yeah a few people said that. I dunno he looked fairly sharp vs. Ivo. Should be able to get himself up for the final. You’re really going some Jonathan and no reduction in quality either 🙂 The fact that Fed still won despite being faced with 33 aces says it all doesn’t it? What a guy 🙂 Now the final, Go Feds! A great and patient win. I thought Roger looked tired. Hopefully he recovers for tomorrow. Concerned about that. Big decision for him whether to chase no 1. Brennwald has his name in HUGE letters outside the stadium. Says a lot, doesn’t it. I couldn’t really tell if he was tired on court, looked to be moving pretty well when he needed to. Could be I guess, but got a nice gap between now and the final. 2.30 start. Fed has been in clutch mode for what seems like quite a while, I really think his inspired play in Shanghai in saving those match points was the start of it – hoping he never steps out of it. His serving has been so on song throughout the week. Was impressed with his play against Dimitrov in saving those set-points, but just as impressed with his mental fortitude today – that one game at 4-4 I genuinely thought he was gonna get broken after hitting those two DFs on the bounce, but he found a way out of that game and the match itself. He’s pumped up, he’s hungry and I’m hoping he gets that win vs Goffin, whether he grinds it out or plays flashy tennis. Gotta arrest the losing streak in finals in his own hometown! Yeah needs that 6-5 winning record. Wow, 3 separate posts in one day – you’re spoiling us, Jonathan! Am hoping Roger will have time to recover before tomorrow (oh wait, it *is* tomorrow already), and will play well. He seems to be doing nicely whenever I don’t pay him any attention, so you’ll be glad to know I’ll be in the cinema tomorrow afternoon :). I really hope he manages to win tomorrow, despite possible tiredness. I need to hire a ghost writer. A walk among the tombstones is my latest recommendation. Decent. Dunno why people are kicking off about the crowd. What do they expect? Yeah, he is after all their hometown hero surely support will be tremendous. It helps to spur Roger to play better. Will be interesting to see how things goes at Lille, I think the crowd will go crazy there French or Swiss. Hope Roger doesn’t Goff it up. “Goff it up”, haha hope not! Great tournament so far by the GOAT, hope tomorrow seals the deal and then skips Paris. He can then be fresh for WTF and DC. Getting another no1 is meaningless (just like H2H), way more important to conquer another WTF. I don’t think he will skip Paris now. Probably left it too late. Let’s hope he can reverse his finals wins today, would be a great confidence for him to win at his home tournament (and a nice kick in the nuts to Brennwald). I agree with Jonathan, I think he is going to blow through this final! Hope so. Definitely should be able to dictate play if he moves well. Goffin could be tricky though, he’s quick and strikes it well. Record since Wimbledon is crazy probably be top 20 soon. Good news is he has only ever beaten 1 top 10 player. Three posts in a day? Wow, overwork alert, Jonathan, your fans are worrying. What a nightmare match to watch but brilliant one. As you get older, become grumpier. How come our old man kept being so calm and patient? Strong mentality, just impressive. Loved the great ‘overheaderer’ day, never mind the one crucial miss in the 2nd set in the end. Yeah I need a pay rise 🙂 Either that or some free Davis Cup tickets. If he wins then guaranteed to raise the roof. Just gotta play at a good base level and he’ll win. Goffin will likely be nervous. Many thanks, Jonathan for delivering these posts in the Karlovic’s serving speed. Agree with your analysis, I am pretty sure that Roger will find a way to win today, since when Goffin becomes a threat to Roger? This shows how much we Fed fans were ‘scarred’ by 2013. Roger’s Basel final stat is a bit interesting – he managed to lose five times here. I don’t think that he has lost that many finals in any other tourny. Anyway, on Brennwald, don’t know why this guy treats Roger in this way. This year’s tourment is almost uninteresting without Roger turning up and attractingg large crowd. Clearly, this guy does not know enough who pulls the tennis crowd. No matter, allez Roger! Goffin is on a very good run so he’s a threat. Look at how many titles he’s won since Wimbledon. On the other hand, he also confirms Nadal has a contract for next year again. Hey Thinker, I had actually the same thought last night (as Brennwald). Against THAT and I mean THAT Karlovic (33 aces Karlovic) …. THIS Roger was seriously the only one on the planet who could beat him. You cannot tell me that Novak or Andy or Rafa could have beaten THAT Karlovic in the SF…. Hey guys, like Miss Tina says…. Roger is…. simply the best 🙂 The guy to beat. But some commies are still…. I don’t know what to call them. I think Lee Sharif said after Roger won, that Roger played good, but that we also had to think about the fact that he hasn’t had to play Rafa a lot this year, only once. Because he had to play Novak and Andy more, the guys he has a good chance to beat, is the reason he is in such a good position the be nr 1…..
Who will tell that stupid man that is it Roger’s fault that Rafa is a no show at 7 tours where Roger WOULD have beaten him IF they would have met?? If Rafa was on the other side of the net?? Roger would have beaten Rafa at Halle, Wimby, USO, Toronto, Cincy, Shanghai, Basel and he could have even beaten him at IW earlier on. And in his current form definitely at Paris and WTF. How would the H2H be then?? 20-23?? Why are commies still saying that Roger is lucky that he hasn’t faced Rafa, when it is ALL Rafa’s fault that he is not on the other side of the net??? Why?? Why?? It bothers me sooooooooooooooo much… Can’t they just give Roger a break?? Why don’t they see that he is STILL playing while THEY are commentating from a chair?? Because Roger is still that good and will keep on winning…. Forget about the stupid H2H, as you said, during this year only, there are 7 chances that Roger can beat Nadal, only this year. And they have been on the tour together since what, 2005? The only reason those H2H appears like that right now is because Nadal always have a perfect timing for his “injury”. Out of curiosity, I type on google “List of Nadal…”, 2 out of top 5 suggestion is injury (1) and superstitions (5), the rest is titles, masters, and matches. Google knows. Roger is the most criticised player out there. Some people expect perfection from him. And are the first to pounce when he falters. That is just the way it is. Enjoy the win and ignore the bs. What is that 150 points for Davis Cup doing there ?? Novak didn’t even play any Davis Cup this year. Highly confusing. And will the points Roger gains this year in the Davis Cup final be counted in his total ?? If it does then if we add 225 and deduct 150 from Novak’s total then we are left with a difference of only 115 points right now ! !